There is a little recognised talent, known in the music industry for years, but only recently being recognised by the public, that is as crucial to the heart and soul of all music as the guitar player, the vocalist, the drummer and the song writer. That’s the talent of the careful listener, and particularly the listener who is able to capture the spirit of a sound and turn it into something else. It was listeners like Chris Strachwitz and Sam Phillips that captured music and turned it into a tangible product, a piece of listening you can pick up and take home and play as many times as you want. It was people like Sam Phillips who were so finely tuned into that strange and unfathomable place between the musician and the listener that they could pick raw and unformed talents such as Elvis Presley, Carl Perkins, Roy Orbison and Johnny Cash, peel away the layers and provide us with the great talents that, not only we take for granted, but formed the foundations of rock and roll. 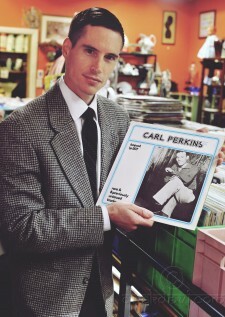 Like so many of these stories, Sam Phillips’ passion for music started with his desire to make it. But one of the problems with having a true talent for listening, is that even the ego can’t fool the intellect into believing passion is the only thing necessary for a fine performance. Sam Phillips couldn’t sing, and it was partly this that forced him to the other side of the microphone, and it is this that underlies the credibility of the organisational talent who do not produce the sounds themselves but satisfy the listener through providing. He loved music so much, believed in it so much, he couldn’t prevent himself being a part of it in whatever capacity became available. For Phillips that meant being a DJ on the now so famous Muscle Shoals radio station in Alabama, and the start of a passion that would see him embrace not only black musicians, but their musical styles that would translate to performance acts such as Elvis Presley. Move forward seventy years in time, and across the other side of the world to Sydney in the year 2013. John Kennedy decides to bring the story of Sam Phillips and his remarkable ear to the stages of Rozelle in a fine little show entitled Sons of Sun. John Kennedy is well-known to the Sydney stage as front man to the band JFK and the Cuban Crisis, Love Gone Wrong and The ’68 Comeback Special, bringing the spirit of the Sam Phillips era to raving fans and happy nostalgia-types alike. In a fast paced and cheerful show, his talent and years of immersion in the music Phillips loved so much come together bringing the heart and soul of Memphis to the well trodden boards of the stage at the Bridge Hotel. Neil Gooding directs Sons of Sun as a rock and roll play, with John Kennedy and his band holding centre stage through the entire performance. As they make their way through so many of the extraordinary songs that came out of the 50’s Sun Studio, Matt Charleston, Corinne Marie and Damian Sommerlad perform the bare bones of the fascinating Sam Phillips story. Playwright Kieran Caroll has put together the key moments according to the music, rather than Phillips life story, so as the play progresses the audience feel closer to the music and warm into the feel of early days blues and rock. 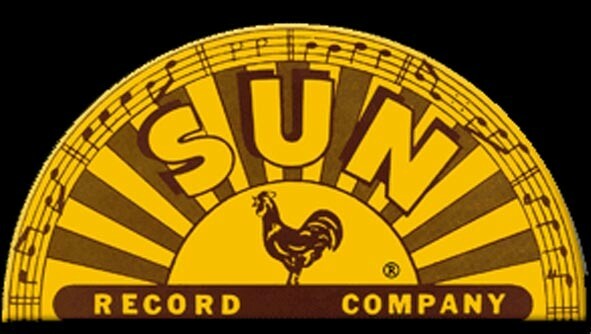 There is still plenty of the detail that makes the Sun Records story so remarkable, the early days of dedication and poverty, the shocking selling of the rights to Elvis for $35,000, and the famous advice to Jerry Lee Lewis not to marry his cousin, but added into the narrative is a warmth for the sound so that any controversy surrounding Phillips fades into what the man was truly about: the music, the musicians and all they stood for. Matt Charleston is controlled and comfortable as the staid and steady Phillips, taking advantage of his opportunities, passionately in love with the music. Phillips comes across as a man who struggled just as much with wealth as he did with poverty, but Charleston gives him a heart as well as a brain, highlighting Phillips’ preference for the music of the local blacks as an act of radial rebellion. Corinne Marie is Marion Keisker, a woman who may or may not have been in love with Sam, who stood by him and became the rock and foundation for the man who was the rock and foundation for others. She has some of the best lines in the script and she delivers them with wit and excellent timing, her slightly raised eye brow being seen clear across the dark room. Damian Sommerlad has the difficult role of playing the narrator and “all the other male characters” as the credits go in the program. Characters that include Elvis Presley, Carl Perkins, Jerry Lee Lewis, Johnny Cash and Roy Orbison. In a clever twist to the direction, when it comes time for him to “perform” he turns his back to the audience, allowing John Kennedy to take over, and the small action occurs as a tribute, as if artist is second to music – a reverence the audience feel comes direct from Phillips himself. In the end, however, the Sam Phillips story is not the tale of a man, a career, a recording studio or the selling of the worlds greatest performer just before he became huge. It’s a story about music and about a man who had the foresight and accompanying passion to do something about the music he saw all around him. He’s the man musicians dream of, the would-be-performer who loves the sound as much as they do, and just wants to spread the word. He’s the man fans have to thank for bringing something he heard that sounded “pretty good” to the broader audience, so that names that have become legend were not lost in the bustle of bars down the road. Sons of Sun is currently performing at The Bridge Hotel with performances on Friday November 22 and 29. Grab your tickets here, and make sure you get to one of the final performances. Image taken from Frank Beacham’s Journal. Click on image to get to site.